Ignacio Jr Hernandez obituary. Carnes Funeral Home. 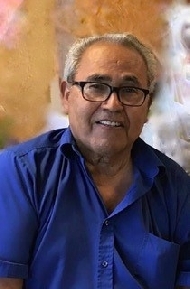 Ignacio “Nate” Hernandez Jr., 74 of Texas City, went to his heavenly home on July 29th surrounded by his loving family. Nate was born in Texas City, TX to Ignacio & Carmelina Hernandez on October 24th, 1942. He graduated Texas City High School, was part of the Golden Gloves Boxing Association and served in the US Navy on the U.S.S Constellation. He married Josephine Saldua on November 26th 1964 and had two beloved children. Nate was employed in the US Postal Office for 32 years. Nate is preceded in death by his parents Ignacio and Carmelina Hernandez, Niece Diana Melchor Jernigan and Nephew Tony Salazar. Nate is survived by his devoted wife of 53 years Josephine Hernandez, daughter Andrea Simmons and spouse Jeffery, son Tre Hernandez and spouse Nahaira. Brothers and sisters, Sylvia Capetillo (Toby), Carmen Melchor, Laura Salazar, Raquel Hernandez, Jorge Hernandez (Tonie), Lavinia Yanas, Ben Hernandez, David Hernandez. Grandchildren TJ Simmons, Arianna Hernandez, Clayton Simmons, Landyn Simmons and Great-Grandson Rusty James Simmons. Memorial Service will be held Friday August 4th, 2017 at Carnes FuneralHomes in Texas City. The family of Ignacio Hernandez Jr wishes to extend our sincere thanks to Hospice Care Team, Dr. Jana, Dr. Gajjar transfusion team of Victory Lakes, and Mainland Community Church.